Jay Huff Soaring To New Role With Virginia Basketball? Virginia redshirt sophomore center Jay Huff has stepped up his game on both ends of the court in the past four outings, and he appears to be establishing a solid role for himself in the process. Jay Huff pump-faked from beyond the 3-point line. His defender behind him, Huff made his move to the basket, needing only one dribble before launching. 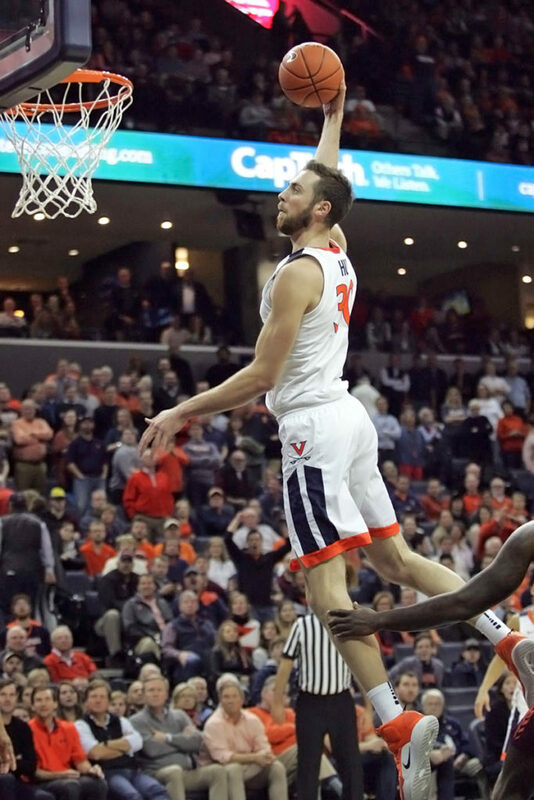 The Virginia men’s basketball redshirt sophomore forward soared through the air for a highlight-reel dunk in last Saturday’s matchup with Duke in Cameron Indoor Stadium. The dunk rightfully received some Twitter buzz, including the likes of Hall of Fame writer David Teel. Where did THAT comes from, Jay Huff? Virginia fans have seen glimpses – or “flashes,” as head coach Tony Bennett has said – of Huff’s considerable offensive abilities over the past two seasons. Maybe not quite as flashy as the dunk in Cameron, but the fans have seen Huff dunk, throw down alley-oops, make 3-pointers, run the floor. Some have questioned why he hasn’t seen the floor more. A razor-thin 190 pounds coming out of Voyager High School (Durham, N.C.), Huff redshirted, as expected, his first year on Grounds. Virginia fans’ first glimpse of skilled big came during the Cavaliers’ second game of the 2017-18 campaign – an easy win over Austin Peay in John Paul Jones Arena. The 7’1” post, then a redshirt freshman, sparkled, pouring in 16 points on 7-of-8 shooting, including a perfect 2-of-2 from beyond the arc. He added five blocks, four rebounds and two assists in 24 minutes of play. After playing in 10 of Virginia’s first 15 games of the 2017-18 season, however, Huff’s opportunities decreased as the season wore on. He would play in only two of the Cavaliers’ final 19 contests (a shoulder injury kept him sidelined for Virginia’s NCAA Tournament first-round game), bringing his total amount of games played to 12 out of a possible 34. Huff would see only 106 minutes of playing time, averaging 3.4 points per contest while coming through with 14 blocked shots, in his first year of major college basketball. Coming off a redshirt year, the versatile post was hoping to be a bigger part of Virginia’s success last season. He didn’t seem offended, though, by his lack of playing time. The same shoulder that sidelined Huff for the UMBC game required surgery, and Coach Bennett estimates the rehabilitation lasted about five or six months. This was a significant setback in terms of adding strength and mass. Though he missed some offseason work, Huff, who proclaimed last October that his shoulder was “basically 100-percent” last fall, was healthy to start the season and anxious to play an expanded role. Through UVA’s first 14 games of the 2018-19 season, the bigger role Huff envisioned had yet to come to fruition. He reached double-digit minutes of playing time in only four outings and did not play against Wisconsin, Maryland and South Carolina. The offensive flashes were still there, with the redshirt sophomore making 65% of his field goals, including 4-of-7 from 3, in that span. Over the last four games, though, Huff’s fortunes appear to be changing. As is the case with anything involving Coach Bennett’s Cavaliers, it starts with defense. After a not-so-sound performance in which he picked up three fouls in seven minutes versus Boston College on January 9, Huff has been a spark for the Cavaliers off the bench the past four games. He provided a huge lift in a road win over Clemson, scoring 11 points, pulling down seven rebounds and blocking a shot in 10 minutes of play – all in the second-half. The homestanding Tigers had closed to within four points of the Cavaliers when Huff entered at the 15:46 mark. He scored five straight points for the Hoos, who ultimately routed Clemson, 63-43. Since leaving Death Valley, Virginia has taken on Virginia Tech at home, Duke in Cameron, and Wake Forest at home. Huff was solid in all three games, turning in a 7-point, 2-rebounds, 1-block outing versus Virginia Tech, a 4-point, 2-block outing versus Duke, and a 12-point, 2-rebound, 2-block performance versus Wake Forest. Huff played 11 minutes versus the Hokies and 13 versus the Demon Deacons. Huff’s improved defense allows him to play more, and it gives UVA some offensive firepower off the bench that could prove beneficial for the Cavaliers’ postseason prospects as he is a difficult matchup for opposing defenses.